It’s been a busy couple of months for our sporting partners. In this update we start with some great news about our partnership with Leicestershire County Cricket Club. On the 7th March Leicestershire announced Your IT as the clubs new ‘Official IT Partner’ until 2024. The deal means that we will be supporting the IT infrastructure at the Fischer County Ground for the next 5 years, as well as providing Service Desk support for Leicestershire CCC staff. In time for the new season we’ve installed a new on-premises server solution and are refreshing the Wi-Fi points around the ground to improve access for corporate hirers and supporters alike. Leicestershire’s Interim CEO Roy Bent said: “I am delighted to welcome Your IT into our portfolio of valued partners. The landscape of communication continues to evolve so it is important for us as a club to have industry experts on hand to give sound advice and offer a first-class service to keep the business operational. In order to secure the contract, we went through a thorough and lengthy selection process, developing an innovative solution to address significant connectivity problems that staff had faced previously. The Foxes start the County Championship season at Sussex on Friday 5th April, with the first home match taking place against Worcestershire on Thursday 11th April. Leicestershire will be looking for a good season in the Championship, Royal London One-Day Cup and T20 Vitality Blast whilst also hosting Pakistan in a Tourist T20 match and the England Ladies International Team. Results have been disappointing throughout February and March with The Hornets only managing a single win. The solitary win came at home against title-chasers Chester, with the Hornets running out comprehensive 35-7 winners. Winger Callum Dacey notched 4 tries, Josh Smith 1 and Joe Wilson bagged a full house of conversions. Whilst this was a win to savour it also smacked of what could have been. On their day Hinckley are a match for anyone, however the rest of the games in the 2 month period have seen defeats to Hudersfield (which ended the unbeaten home run), Flyde, Sedgeley Park, Otley and their heaviest defeat of the season to Preston Grasshoppers by a score of 48-19. Hinckley have fallen just below halfway in the table and the club will be looking toward next season and some rebuilding work to be done with four games of the season remaining. The Ewe Rams followed up their striking 10-0 win over Bradford with an equally impressive 7-2 victory over Hull City Ladies. 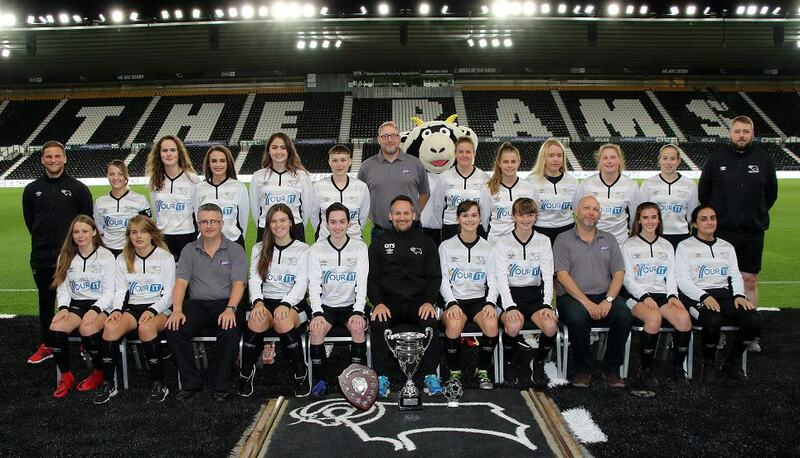 Monique Watson, Amy Sims, Andi Bell (2), Cara Newton (2) and Steph Smith the Derby goalscorers. The positive results continue as goals from Stephanie Smith and Andi Bell gave the Ewe Rams a 2-1 win over Stoke City but Flyde Ladies were able to end the run in the next match, winning the game 1-0. A last minute winner saw Derby bounce back and defeat Bradford 2-1 after a spirited display from the visitors, who had certainly tightened up since the last meeting. Grace Harrison gained the victory with the last kick of the game, Stephanie Smith the other scorer. The final match of the period was the A52 derby against Nottingham Forest. Derby had beaten their closest rivals 1-0 at Pride Park but needed another very late goal, this time from Smith, to grab a point in the return. It was a case of so near yet so far as, in the dying seconds Jodie Redgrave struck the bar with the keeper well beaten. It would have been harsh on Forest and a draw was probably a fair result.